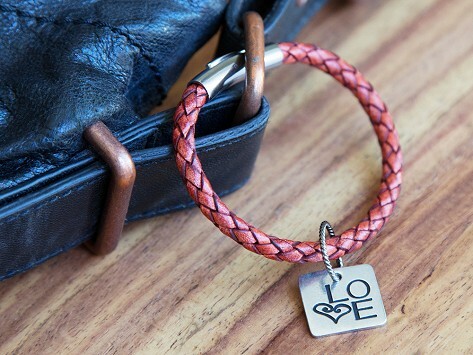 Soft leather and the charms are lovely. This is a great keychain! Great for you or as a gift! Well made and so strong! I keep keys and story disks w me all the time! You will lve this and it will become your favorite gift! Fabulous for you or gift! Love this! It's pretty, strong and carries a message you choose. It's the best gift of the year! I bought the keychain and two charms as a gift. I loved the presentation when it arrived in the pretty book box. The quality of the keychain was very nice as well as the charms. I felt like gift was unique, nice quality, and made in the USA a definite plus. Well made, bought for a gift but kept for myself! Given to my sister whose partner of 25 years passed away. I have not seen this purchase in person as it was for my sister who lives in another state. Her partner of 25 years passed away suddenly. He would always pick up pennies he'd see on the ground. My sister was telling this story when I was bavk home eith her. And the day of Tom's funeral she found a Penny by her car. When I was back home I received an alert of new items in The Grommet and it was the lucky Penny keychain. Of course there was no second thoughts on this purchase. My sister received it and I can say from her words, She Loves It! !